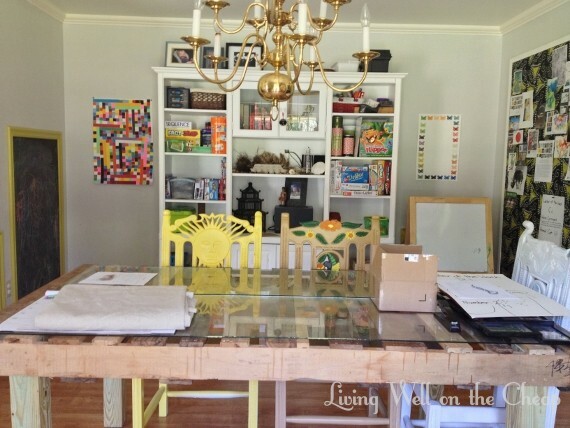 You may remember that a few weeks ago I bought a painting from my friend Bethany’s son.I mentioned then that I hoped to share some photos soon of Bethany’s home, and today’s the day! I took Jack over there for a play date yesterday and snapped away. Bethany lives on the other side of town from me (conveniently located near my favorite Target!) and I got almost all the way there before realizing I’d forgotten my camera. I turned around and rushed back, arriving 15 minutes late with camera in hand only to realize I was sans memory card. It was not my lucky day, but I chalked it up to first world problems and took pictures with my iPhone instead. 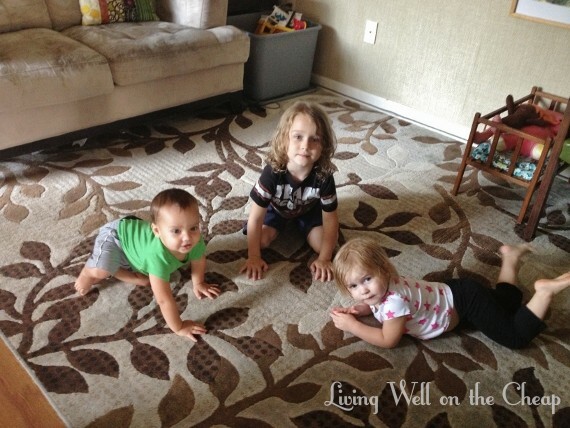 Behold, three charming and beautiful children: Jack, 5; Indigo, 2; and of my course my Jack, 14 months. It’s really hard to create a home that is both kid-friendly and pleasing to the grown-up eye, but Bethany has hit the mark in my opinion. 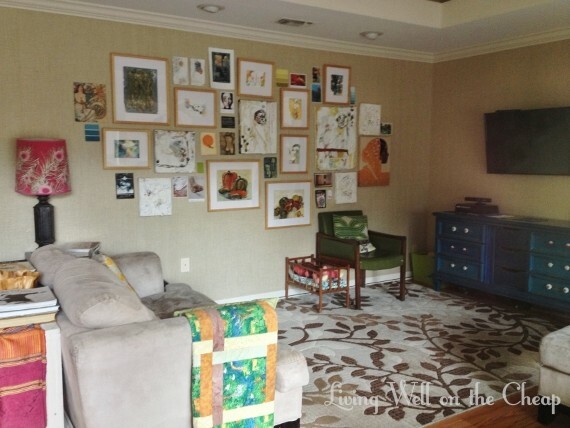 Their living room is fun and comfortable for all ages. The grasscloth wallpaper came with the house, amazingly. That sort of thing is not common in Louisiana. 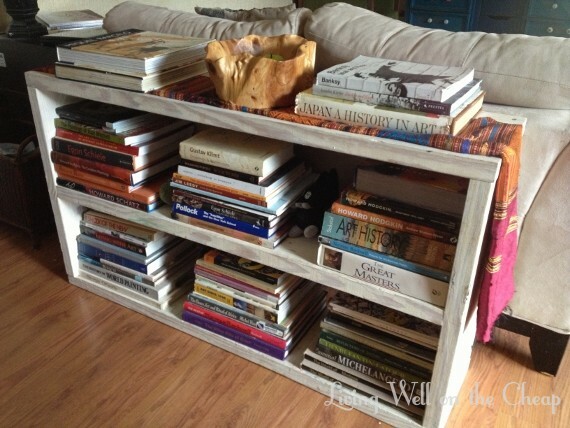 Bethany’s husband built this sofa table from 2x8s, using wood glue and screws to attach the joints and then whitewashing it. A lot of the art here was done by Bethany. I think it’s so wonderful that her kids are growing up surrounded by interesting things. The blue and green bunting across the huge wall of windows is so cool. And how luxurious is it that Bethany can sit on the sofa and watch her kids play out back? Jack isn’t old enough to play outside alone yet but I was still really jealous. Bethany pulled this old entertainment center from a curbside and she and her husband turned it into a play kitchen for the kids. See? More kid stuff and grown up stuff happily coexisting. I love it. When Bethany and Jeremy bought the house the entire foyer and front living/dining area were painted the pale yellow that you see on the door. Trim, walls, everything. I think it’s much better taken in this smaller dose. 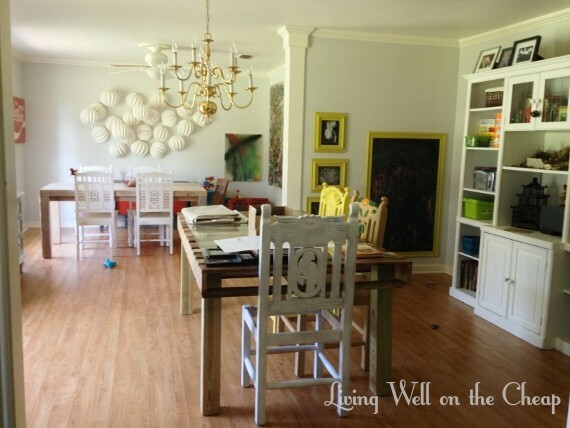 This formal living room is used as a work/school zone with the dining area just beyond. 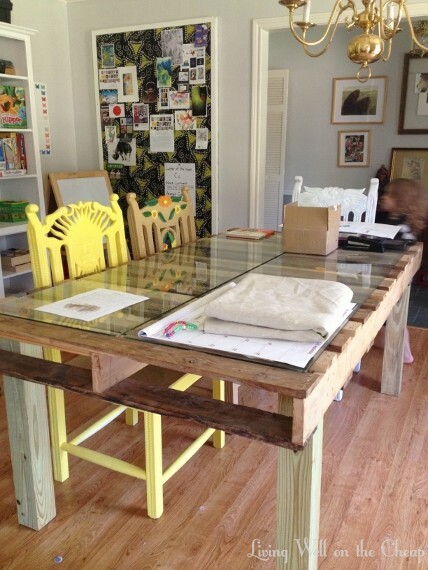 They built the work table from pallets that the dining table was shipped on, then topped it with a piece of glass for a smooth work surface. This was an old-school corkboard that Bethany covered in funky fabric and now uses as an art inspiration board, with a little bit of homeschooling brought to you by the letter C.
This chest of drawers and the blue one in the living room are an identical pair purchased secondhand on separate occasions. The one in the living room serves as a media console, this one as a buffet of sorts. She refinished them both, obvs. 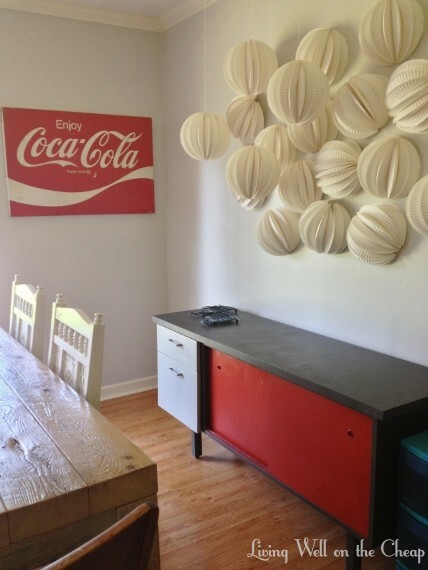 The art installment on the wall is made from paper plates (by Bethany, of course). Some sweet potatoes sprouted in their pantry and Bethany decided to turn it into a teachable moment by placing them in a sunny area to continue growing. I love that they look sort of sculptural and rustic. Every time I visit Bethany’s home I leave inspired to make my own home a little more fun. And if you want to see more of her kids’ awesome artwork you can check out her new Etsy shop. I hope you all were as inspired as I was, and that you each have a lovely weekend. Thanks for reading! 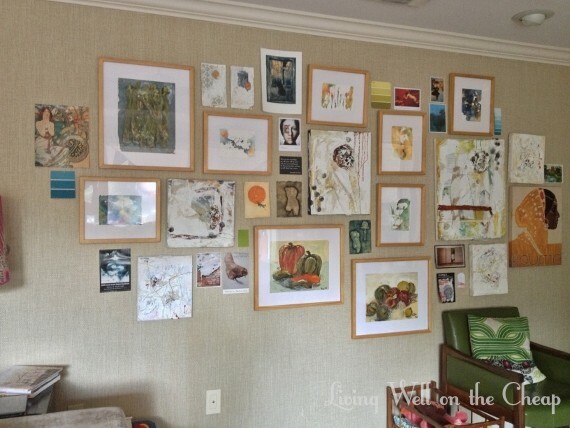 What a charming, artsy home:) It has inspired me to keep at my own home which leans more toward the eclectic… I started looking around realizing I could really jazz up a few corners with a few more touches. I’d love to know the name of the really pale grey walls in Bethany’s home. The ones that those gorgeous yellow-gold chalkboard frames rest against. Bethany, i like your style! Love it! Sorry I took so long to respond! I wanted to check with Bethany on the paint color (she was flattered by your comment, by the way!). She says she thinks that it was called Warm Chinchilla and made by Valspar. Thanks so much for checking on the paint color! Seriously awesome home. I agree! Every time we visit I just stare around the whole time, haha.